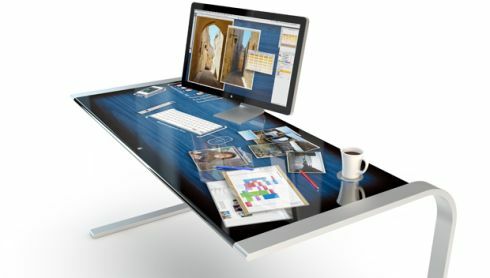 Remember the Microsoft Surface technological table? This concept was forgotten a while ago, but some people are fond of it, like Adam Benton who created an equivalent in the Apple universe, the iDesk concept. Published on Maclife, this design features a huge chunk of touchscreen being used as a workaholic’s desk, with the ability to sync to all of the iDevices on the table. This device is able to sync with any iOS gadget placed on it and it doesn’t even need a mouse, as the whole touch area is a giant trackpad. You can make calls, edit Office documents, view Adobe files and watch vides straight on the iDesk. This huge workspace also seems to project a virtual mouse and maybe keyboard too, unless you like the normal one. I guess you can also scan pictures with it and instantly post them online, if it’s not too much to ask. 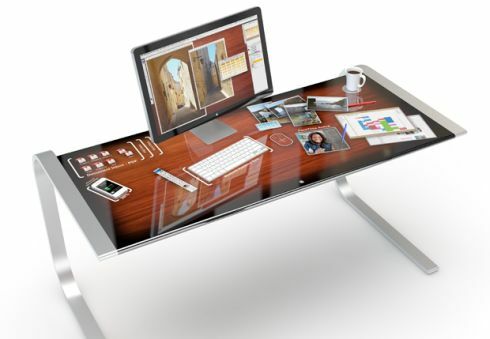 This desk could either have a Mac built in or connect to one that you already own. All content is synced within iCloud and kept up to date with all your other devices. You can also move around the stuff you need, like on a real desk… For example, you can move the Facebook statuses aside, open a YouTube video, resize a picture, check an email and open a new document, all of that while drinking coffee. Would you buy such a device even if cost… let’s say $2000 or $3000?